Yes, I am a Miss Rumphius wannabe (hey, I already have the hair bun going on sometimes too). 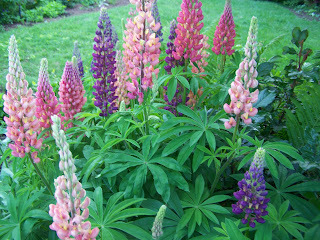 Since someone asked me what colours my lupins were I feel perfectly justified in posting all these lupins pictures. 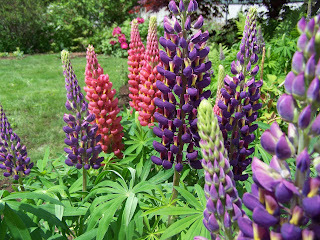 ;-) This way if you got some lupins from me you will know some of the colours they may be. means you never know what they'll catch next ... and want to show you. This cricket has been serenading us for the past couple of days. The rain slowed him down a bit, but he made up for his brief period of silence when the sun came out again. 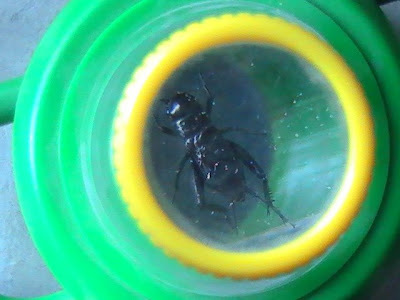 It's totally amazing how such a small insect can make such a penetrating sound. If only he'd kept quiet, he likely would've evaded his captors! For some time we have had the link to the Path to Freedom website in our blogroll, this morning I came across this link to their 100 foot challenge. If you have time to watch this I think you will find it quite inspiring. "Eat where you live" they say and I think that is a pretty sound idea. We don't all have year round growing weather or all the groundwork in place as they do now but I think their point is to just make a start where you can...and to make your road by walking. The waffle iron has been fully employed lately after a hiatus at the back of my cupboard. Pictured above is my latest waffle version. 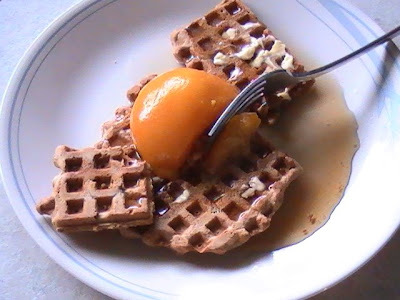 Whole spelt flour waffles with chopped almonds, topped with home canned peaches and some maple syrup. Waffles were a favourite when I was a kid and bring back some great memories. We were always experimenting with toppings to put on our waffles. Homemade jams & jellies were tried or we spread on some peanut butter (it's a waffle sandwich! ), but my all time favourite was to make an ice cream sandwich with piping hot, fresh waffles. Mmmmm... what a treat! Preheat waffle iron. You may lightly grease the waffle iron if needed ( I don't need to do this with mine). In a large bowl stir together the first 3 listed ingredients. In another bowl, mix together all the wet ingredients and the nuts (if using). Add the wet ingredients, all at once, to the dry ingredients in the first bowl and stir until just combined. **I use 3/4 cup to 1 cup of the batter to make each set of waffles on my iron - you may have to increase this amount by another 1/4cup depending on your waffle iron. The important thing to remember is that you need to add the batter to the iron and then quickly close the lid and do not lift it during the baking time. Cooking time on my iron is approx. 4-5 minutes and then I remove the waffles using a fork. and as soon as they come out, so do the fuzzy bumble bees. These white flowers are spreading on our hill as well. 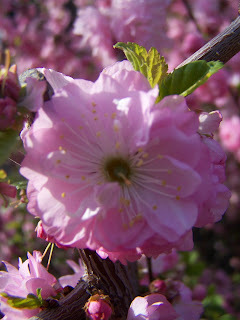 A couple of weeks ago, we planted another plum tree. It was barely a twig when we planted it but now it's sprouting leaves left and right (above is one of the first branches to form). 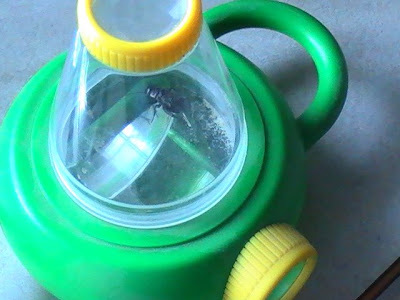 It never fails to amaze me how something so lifeless looking can come alive so quickly. The first of my columbine to flower. Most surprising to me was that since this was a transplant from another area, I didn't think it would flower this year. The hardiness of plants is amazing. And lastly, this special little guy. 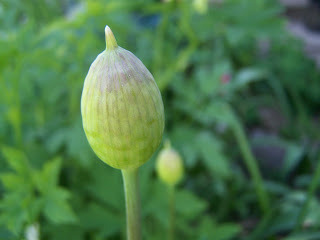 It may look like an Iceland poppy to the average eye, but it's a special addition to our garden. L picked it out ever so carefully (he told me that it needed him - how could I say no to that? 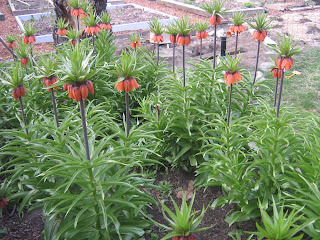 ), brought it home and planted it where he felt it would have lots of company. It was closed, so he had no idea what the colour would be. About a week later, he woke up and looked out the window. Cheering and big hugs celebrated that his special flower opened, and that it was yellow (although any colour would have been greeted with the same happiness). So much joy and happiness from the presence of such small flowers... and this is just the beginning! I am so in love with this time of year. 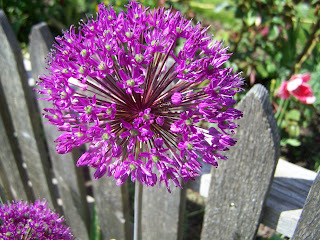 When we moved here there were about three of these allium. Every year I let them go to seed so that I can save seeds for friends. 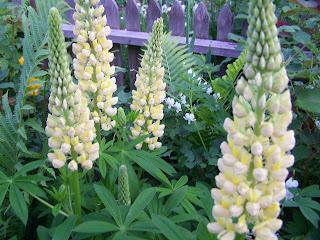 And every year they are so abundant that I don't get all the seeds off and they spread all over. I can't bear to rip them out and so we have loads. Dare I say too many? 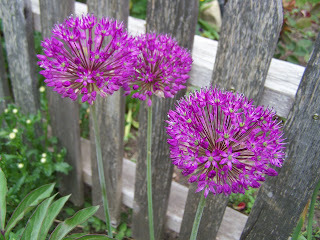 These ones are in the back of the house and you can see all their heads about to burst into bloom. 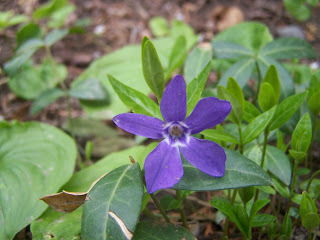 The vinca (periwinkle) that I brought from my parents' place is blooming, I am hoping that this spreads all over in the front shady side garden. 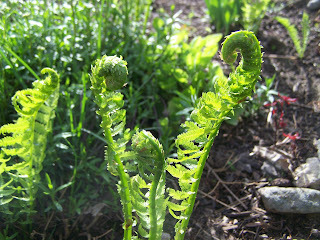 The ferns are unfurling all over. I like using them for a background to bouquets. we have a few of these. I have actually done a pretty good job of keeping up with controlling them the last few years. Every few days we have an "off with their heads" race and pick all the flower heads off before they go to seed. 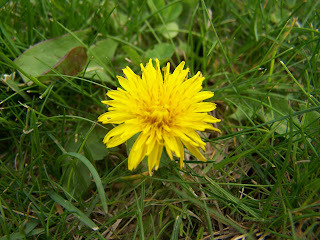 I know that dandelions have many virtues and I do eat the leaves sometimes but I don't really want too many of these around. 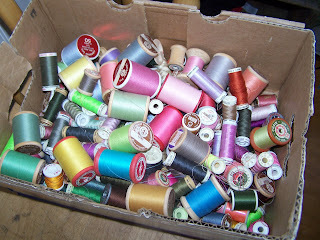 Because $10 can get what is likely to be a lifetime supply of thread for me. I especially love all the old wooden spools. Almost the entire weekend has been spent in the garden. 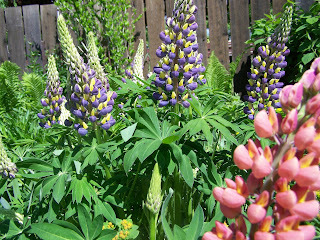 When I wasn't in the veg garden I was in the flower gardens. It is quite possible that I spent far too much time potting up baby plants to give away but I would rather do that than see them tossed in the compost. I still have a large pile of mulch sitting in the driveway but things are looking pretty good around here. 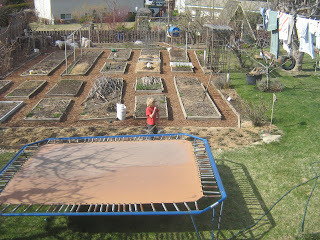 On Friday the boys and I were mulching the side shade garden when I found this. I've no idea where it came from and I don't recall it being there last year. 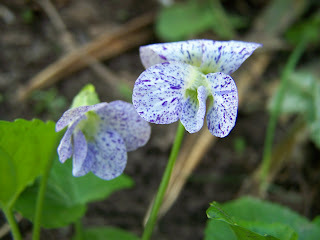 It is so pretty, I just love the speckles. 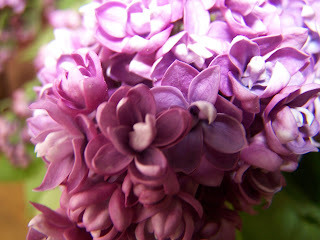 My neighbour brought me some double lilacs, she brings me some each year because she knows that I love them too. 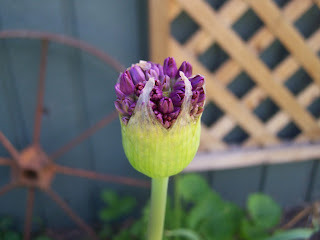 There are lots of firsts in the garden just now, I found the first of our California poppies in bloom, pretty soon there will be thousands of these. 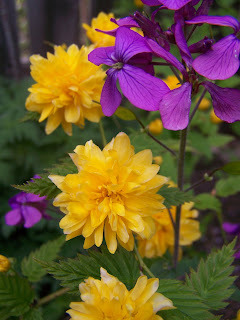 They are prolific spreaders and act as a bit of a ground cover here. 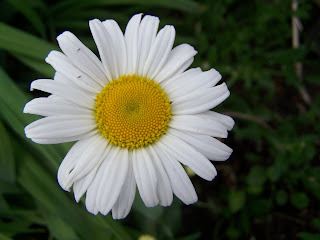 Here is the first daisy in bloom. 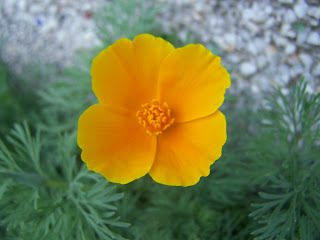 We have loads of these and it is one of my favourite flowers to bring in as a cut flower. They are so simple and fresh looking. 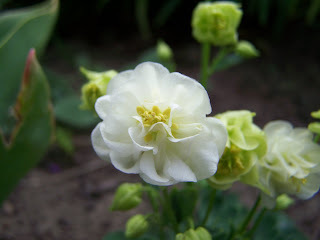 And up top is a picture of our first columbine in bloom, I think that is the one that you gave me last year, Samantha. 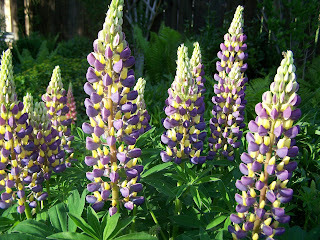 I spent many an hour gathering armloads of these pretty blooms to fill empty milk cartons which I had tacked to my bedroom walls in order to make my room a butterfly sanctuary. 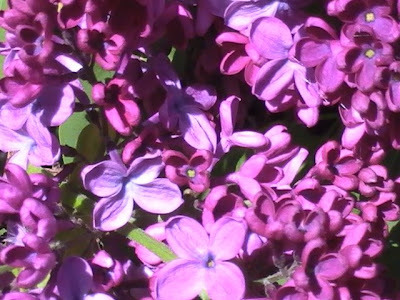 It was magical when my room was filled with the colour and scent of the lilacs, my bedroom window open so that the butterflies flew in and out. What I can't remember, is if I asked permission first or just went with the idea... I do remember how surprised my mom was when I invited her in to show her what I'd done. My room was alive with gently fluttering wings and the sweet scent of lilacs. 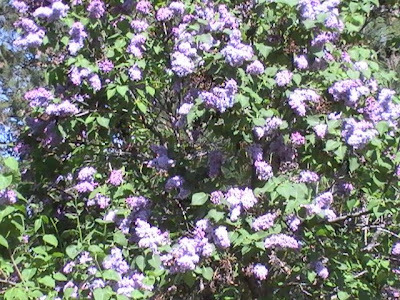 So every year when the lilacs bloom, I throw open my windows and I'm a little girl again. 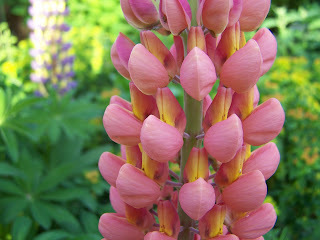 You can never have too many flower pictures, can you? 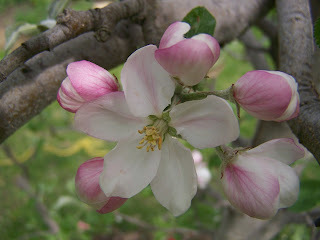 We can't help admiring the apple blossoms, they look as though they are blushing - so delicate. The Kerria is in bloom now too. I brought this back from my childhood home, along with many other plants, when my folks sold the property It is pictured here with some silver dollar plants which have seeded themselves here and there (and everywhere) throughout the yard. And since I really can't ever see too many flower pics but I know that others can, I have posted some separately over here. 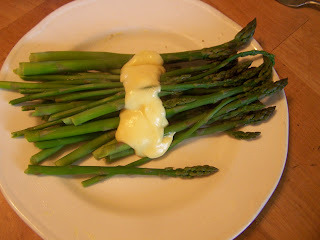 Here it is, our first feed of asparagus. 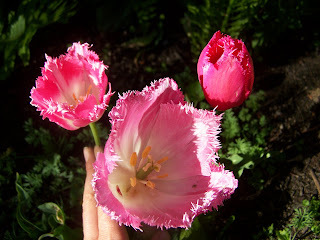 This is not from my garden, a generous friend shared this with us. 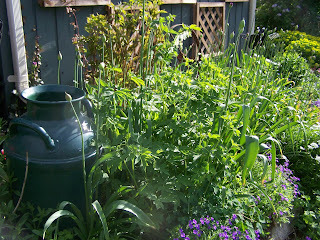 She has incredible long asparagus beds that very much made me wish that I had planted some in my own garden. 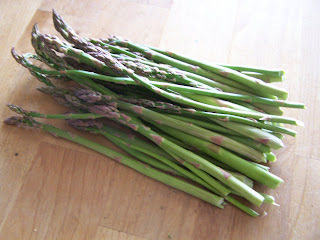 In all my years of living I have never eaten raw asparagus, I was quite surprised to learn that it tastes of raw peas. When I was talking to my mom yesterday ( a huge asparagus fan) she asked me if I had ever tasted it raw, it seems she had her first taste of it raw last week and also thought it tasted like raw peas. I thought it was quite funny that we both had never had it raw and then both did in the same week. Last night I cooked what was left after our snacking and then put it all on one plate to serve it. The boys said that they were full from the rest of dinner so I started feasting right off the plate, fully intending to leave some for hubby (no, really). He thought that his share was still in the pot on the stove and went to get some. I heard him mutter sarcastically, "Thanks so much." Then he helped himself to the one spear that was (accidentally) left in the pot, thinking that that was all that I had left him. I can see how he might have thought that, after all we were having it with hollandaise and it was incredibly delicious. *adding broken bits of dried kombu strips (about 3 strips) to when cooking the beans may help reduce the flatuence beans cause. Sort and wash all beans. Soak overnight OR.... after washing beans put them in a large enough pot to completely cover with water and bring to boil; cook for 3-4 minutes. Remove from heat; cover and let stand for 1 hour. Drain and rinse beans. Return to pot and add spices and water. Bring to boil. Reduce heat; cover and simmer 1-1/2 hours or until beans are tender, stirring occasionally. Add tomatoes and heat through. **The method I use is to soak the beans overnight and then rinse them and add the water given in the recipe to cook them. I bring them to a good boil then lower the heat and add the seasonings (all except the salt, as adding this too early in the cooking will make the beans tough) to the beans. Simmer the beans for a good 1-1/2 hours or more (until beans are tender). The last step before serving is adding in the canned tomatoes (which I like to puree before adding to soup). *** Don't forget to remove the bay leaf before serving. 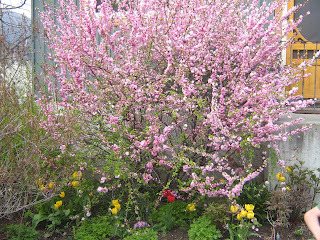 I couldn't resist posting a picture of this tree, it is one of my favourites. 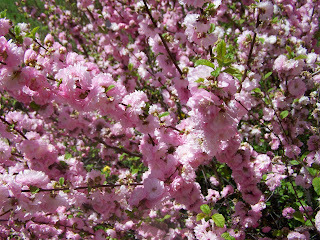 ( Yes, I do say that about each tree in turn) ;-) It isn't quite as spectacular as it usually is, that snow fall and the cold temperatures that we had a little while back put a bit of a damper on it as it had just started to bloom. But still...it is lovely. Wow! Does listening to these boys ever bring back fond memories! 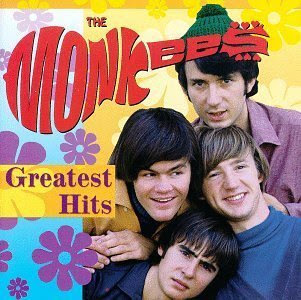 At first, I felt a little bad for inflicting The Monkees on my son, but now he is requesting to listen to them. We seem to share the same taste in songs - he asks me to skip all the ones he's not crazy about and it turns out they are the same songs I would have skipped as well. Poor Davy can't even get out one word in I Wanna Be Free before my finger presses the skip button. Need a quick snack? 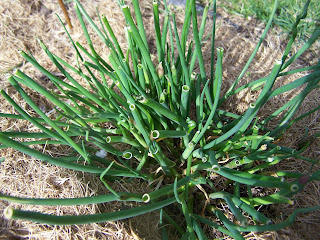 Hows about some chives? It just goes to support my theory that if people can be more a part of their food production, if they can actually see, hear, feel and smell things while they are growing, they will be far more likely to appreciate and enjoy those things...no matter what their age. 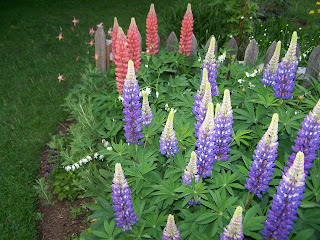 The first year we lived here I couldn't wait for Spring so that I would know what was already planted in the flower gardens here. Early that year little green stubs started to appear in the dirt by the cherry trees, I was quite curious to know what they were. I also started to notice a strange smell about that time, a sort of skunkish smell. These little green stubs continued to grow and grow and soon enough they looked like this, by that time I also realized that the smell was coming from the plants, not a critter hiding out in our yard somewhere. 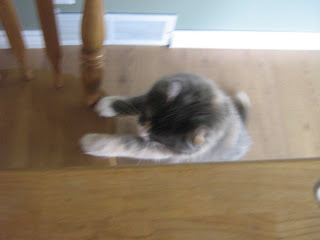 Our oldest cat has been a part of our family long before we had children, she is going on 16 this year. For the last few years she has been in pretty poor shape (such that when we go away I dig a grave in the garden just in case she dies while we are gone). I have seen some improvement with trying different diets with her -changing from kibble to raw and now to mostly cooked sardines and oats with some additions. For my own health lately I have started eating coconut oil - yes, straight from the jar - and since she was watching me as I was eating a spoonful I thought I would see if she wanted some too. I have been feeding it to her for just over a week now and I feel as though she is improving even more, although it could just be that Spring has finally arrived and she is feeling better because of the warmth and sunshine soaking into her old bones (I can relate!!). At any rate, she has been a real source of entertainment to us this past week. It is as if she thinks that she is a kitten again. She hides behind the laundry basket in pounce position; tucks herself in by a big plant my Uncle just gave us, as if she is queen of the jungle; swats at yarn and tries to jump on it and run after it; runs, hops (!?!) and hides when we come round a corner and all manner of other silliness. 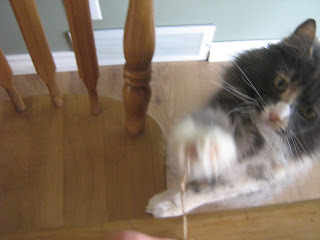 The other day she was watching intently as I picked dried bits off an aloe plant that was up on our table, I decided to wiggle the bit a little to see what she would do. 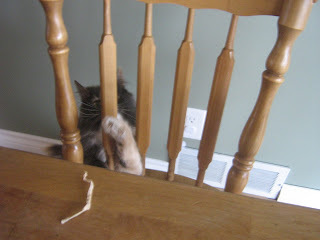 For a cat who could barely get herself onto the seat of the couch several months ago (and was barely able to walk a year ago) I was delighted to see her reaching up to the table top to play. Last night W was in the garage, he looked out the back to see her in the backyard heading back towards the steep stairs leading onto the porch, he rushed out so that he could help her up the stairs only to find that she was already on the porch. Pets...there are times when I wonder what on earth possesses me to bring them home and then there are times that I can't imagine my life without them. Front view and side view. It used to be grass all the way up and through the cedars. R created a magnificent wave around the tree and he plans to continue that pattern across to the other, smaller tree. In the cedar gap, we plan to build an arbour to house our bench in, and create the perfect seating area for watching the many sports that get played what's left of the grassy field. Also on the go is a project to put a path around the garden to the side gate. I took charge of the grass removal on this one and thought I did a fair job - until dedicated and forgiving husband called me over and informed me (with a hearty chuckle) that the start of my line was less then straight. Well, I'd had a little problem working in the tight space by the tomato towers... yes, I could have moved them but then that would have made sense. Lovely garden patio. We will remove the stairs and create a patio in our little garden oasis. Build better stairs, give that poor window a good wash, and spend the rest of the summer enjoying our yard.